When my kids come for a few days I buy a ton of fruit. And then usually have to shop again during the visit to get more, because there's none left. When my kids don't come I buy much less fruit but never run out of it. In fact, the fruit I buy frequently sits there in the fruit bowl, washed and waiting. Then gets too soft for actually eating out of hand and winds up in a banana bread or cold, summer fruit soup or some other recipe that works well when fruit is past its prime. Like these plums. They looked so good when I bought them. Alas, they were not as compelling this week as the chocolate covered cherries or the chocolate covered almonds or the NoMoo Cookies I bought. 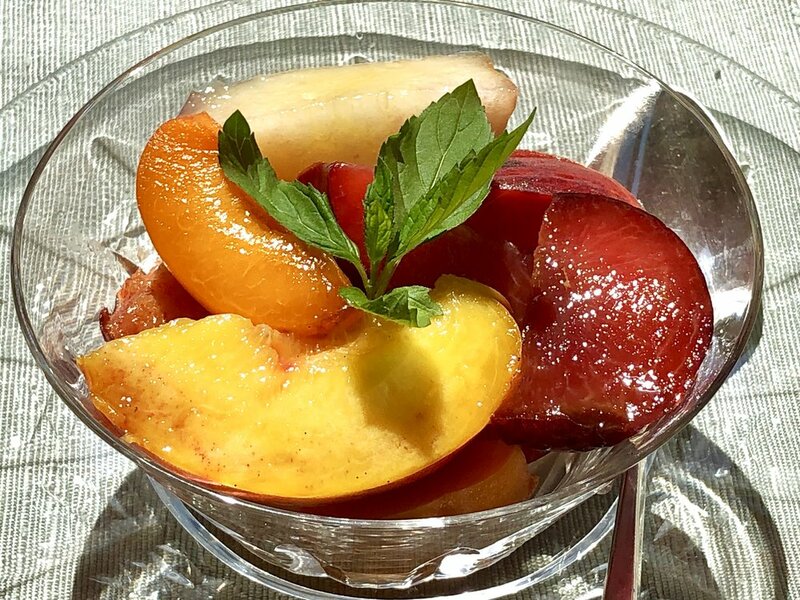 However -- when I poached them in a little honey, added a few cardamom pods and some orange peel, well, then the plums seemed more like real dessert and therefore more welcome. Especially when drizzled with boiled down poaching juices and accompanied by yogurt (plain, mixed with some of those boiled down juices) and chopped, roasted almonds. So the fruit did get eaten after all. No leftovers. Place the honey, water, cardamom pods and orange peel in a saucepan, bring to a boil and simmer for 5 minutes. Remove the pan from the heat. Wash the plums, cut them in half and remove the pit if possible (if not it will be easy to remove after poaching). Place the plum halves in the poaching liquid. Mix in the vanilla extract. Let rest until the liquid cools, at least 2 hours. Remove the plums and set them aside. Bring the poaching liquid to a boil over high heat and cook for 4-5 minutes or until thickened to the consistency of maple syrup. Let cool. Place 2 plum halves per person on dessert plates. Mix a small amount of the boiled down liquid into the yogurt and spoon some of the yogurt next to the plum halves. Drizzle the plums with the remaining poaching liquid. Scatter the nuts on top of the plums and yogurt.